Rules are quoted, then illustrated and explained as seems necessary. (b) shall not be penalized unless there is contact that causes damage or injury. At about this point, it became clear to Uncle Al (far left) that Wayfarer Man (Frank Goulay) who was sailing W937 (a.k.a. W828) and who had just ducked Peter Rahn's transom, had not seen Uncle Al and would not be keeping clear. Al let his main go almost completely and managed to avoid the collision by bearing away violently (but with great panache of course!!) However, the fun had only just begun because Peter (on right in W5631) decided to tack instead of trying to "shoot" the mark. And just as Al emerged at full speed from behind Frank's transom, there was Peter sitting across Al's bow on port tack. Instead of moving out of the way on port, Peter made the split-second decision to tack again. Al bore away a bit and aimed for the one-metre wide gap between the by now almost stationary W5631 and the mark. 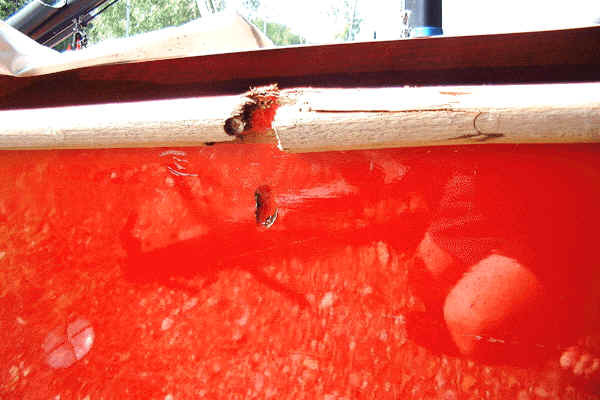 Since a Wayfarer is two metres wide, Al hit the mark quietly and the corner of Peter's transom with a fairly loud crack. Both Peter and Frank did their 720's while Al sailed on to win the race. Not until Al was doing the regatta report several days later, did it begin to dawn on him that he had probably broken Rule 14 since his hull had been cracked in the collision. But it seemed so unfair for the Rules to expect a boat that is being fouled to miss a mark just to avoid a collision with the offending boat. To my mind, everyone had done the right thing. 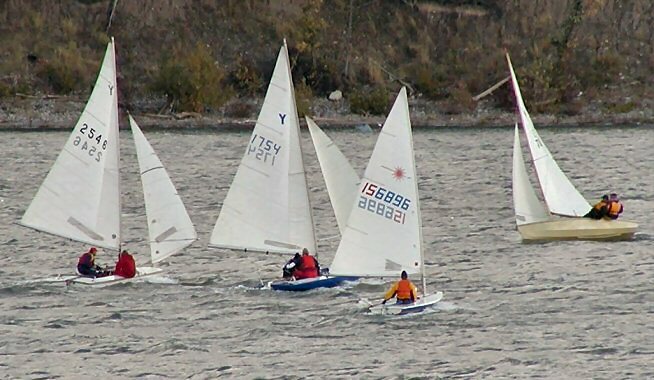 Al's note: As a protest committee member dealing with a possible infraction of rule 15, I would "freeze the action" at the moment a boat acquired right-of-way, and then examine the relative positions of the two boats. At that instant, the "give-way" boat has to be in a position that will give her room to keep clear in the existing conditions if she responds immediately. If the new right-of-way boat is any closer than that to the freshly burdened boat, she has broken rule 15. 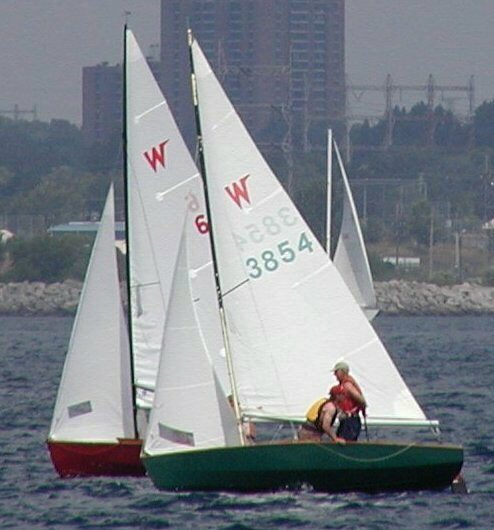 Probably the most common way in which boats racing acquire right-of-way, is by tacking to starboard near a port-tack boat - as Uncle Al (3854) has just finished doing above. 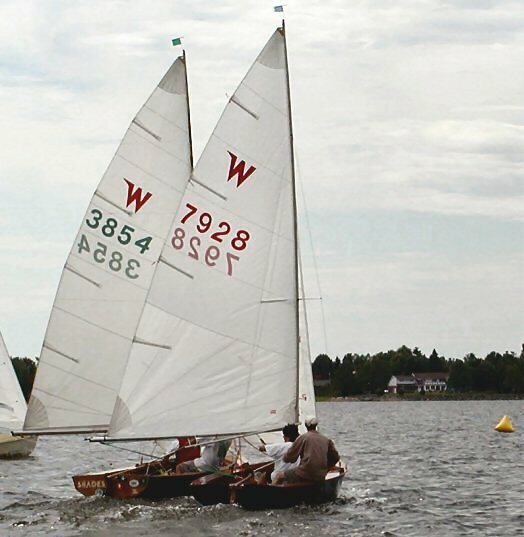 Al lost his right-of-way position as a boat clear ahead while he tacked, then re-acquired right of way when he completed his tack onto starboard. Al now has to "initially give the other boat (Dwight Aplevich in W4606) room to keep clear". "initially" means "at the beginning". Thus, at the moment (captured above) Al completes his tack and becomes the right-of-way boat, the other boat (Dwight in W4606) must immediately begin to take any necessary evasive action. Spending a few seconds deciding whether to tack or bear away will not be acceptable. I have found it very useful to loudly and clearly hail "Tacking to starboard!!" in such a situation, so that the port boat has a second or two to decide whether she should tack or bear away, and at the very least is warned that I'm going to be coming at them. A silent tack too often results in the port boat not realizing that I have tacked until it's too late, at which point it's human nature for the port-tacker to feel that the other boat must have tacked too close. "room" is of course "the space required in the conditions to manoeuvre promptly in a seamanlike manner". As if the word "initially" were not enough, the requirement for immediate reaction is underscored by the word "promptly" in the definition of room. In a Wayfarer, there is no reason why the evasive manoeuvre should not begin immediately when you're in a situation such as the one above. Large yachts with running backstays and such, or a boat with a trapezing crew, would need to be given a longer time in which to react. "keep clear": If the newly burdened boat reacts promptly and in a seamanlike manner but still ends up in the way of, or colliding with, the other boat, then the boat that has just acquired right-of-way has not given the other boat "room to keep clear" and should be penalized. Rule 15 does not offer the newly burdened boat the privilege of choosing her preferred method of keeping clear. Al's note: I look at this Rule as simply telling us that if we acquire right-of-way near another boat, we must do so far enough away in time and space that the newly burdened boat will have a reasonable opportunity to keep clear without having to resort desperate measures. 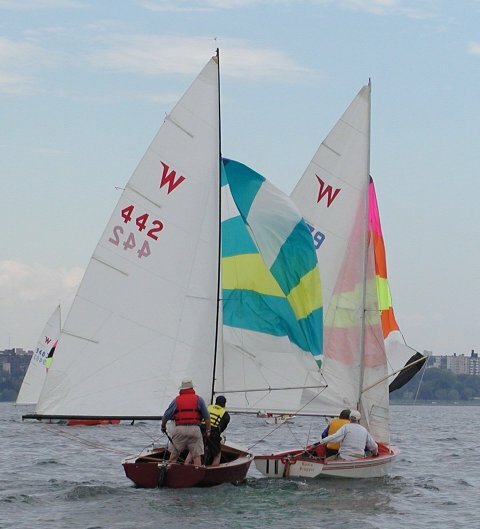 Probably the most common right-of-way switch between boats on the same tack occurs when a faster moving boat that was clear astern (like the yellow-hulled Buttercup above), establishes an overlap to leeward of a boat "sitting" on the starting line with sails luffing - as is about to happen in the photo on the left. The photo was taken a few seconds before the start. Uncle Al (3854) is sitting about a boat length aft of the RC boat with his sails totally eased and luffing and with virtually no forward momentum. Brian Egan, helming Buttercup, is close-reaching in at good speed and will establish a leeward overlap in the next second or so. But at this exact moment, Al is not yet required to take any evasive action. According to Case 53, he does not have to "anticipate his obligation to keep clear". This is quite a safe position for Al who has to "initially" be given "room to keep clear". As soon as the leeward overlap is established, Al must sheet his sails in and re-develop forward momentum and steerage way - all of which takes time - during which Brian must still give Al room to keep clear. While all this is happening, Brian must also go far enough to leeward to avoid snagging the end of Al's boom as it is rapidly pulled in (in a seamanlike manner, of course!!). 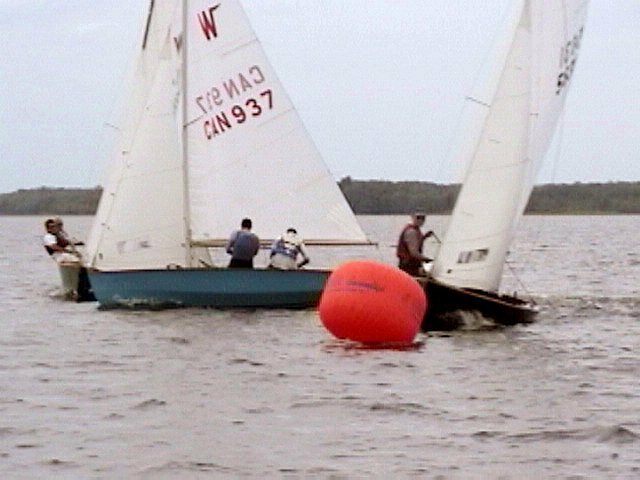 By this time, the speed differential between the two boats should ensure that Brian is past Al before he can cause the latter any problems - unless he luffs up very sharply right after passing the end of Al's boom, a matter which will be discussed next under Rule 16.1. The other common situation in which a leeward overlap is often established from clear astern is on the run. Above - bear in mind that zoom lens photos are deceiving! - Alan Hallwood (W442) appears to be establishing a leeward overlap from clear astern but seems to be leaving Fred Black (W7379) very little room to keep clear. Alan, the overtaking boat, must be careful about establishing his leeward right-of-way position too close to Fred's hull. Fred will have to turn to windward to keep clear - as he is doing here, and that means his transom is pivoting to leeward. If Alan comes in so close to Fred that Fred's hull makes contact with Alan's boat as soon as Fred tries to luff up to get out of the way, Alan has not given him room to keep clear. In the photo above, Søren Jensen in W10212 may soon want to gybe to starboard. When he does so, he will acquire right of way over Christian Bovet in W5128, and must initially give Christian room to keep clear. After a few seconds (long enough to prepare for a spinnaker gybe for instance), rule 15 will cease to apply (because of the word "initially") and rules 10 (Opposite Tacks) and 16 (Changing Course) will apply as necessary. Al's note: In my experience, Rule 16 is the most frequently broken Rule in the book these days. Starting with myself, we often find Rule 16 difficult to obey because, at times, it goes against all our instincts that tell us we should be entitled to do things we've always done - like sail proper course when we have the right-of-way position. More on this below!! In the decision for Case 26, it is pointed out that "the main purpose of the rules of Part 2 is to avoid contact between boats". Rule 16 is very much in line with that philosophy. Assuming that Peter Rahn (W286) has not established his overlap from clear astern, he may alter course towards Brian Jeffs (W9235). There is no longer a "luffing" rule, no more "mast abeam" and other fun stuff. Such activities are now controlled by rule 16.1. 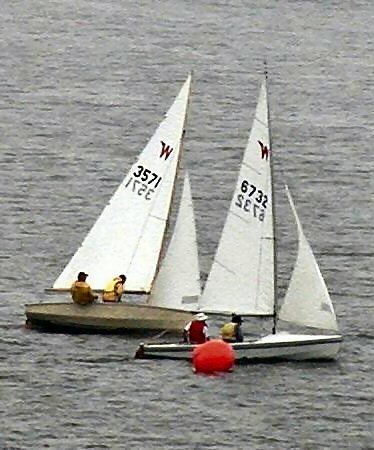 In essence, luffing matches have become an exercise in futility (IMHO) because the two boats quickly reach a stand-off in which they are just far enough apart that Windward is still keeping clear but that any further course alteration by Leeward towards Windward will constitute a foul under rule 16.1. 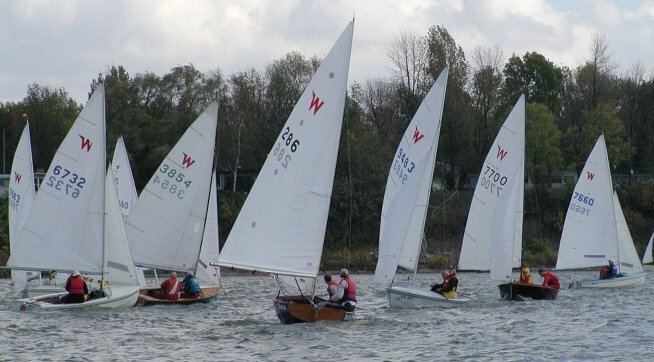 If you are going to defend your wind these days, it is much wiser to make a decisive move to windward before an overtaking boat establishes a windward overlap - and that, I am sure, is what the rules makers had in mind. Above, we have a similar situation: Assuming Bob Frick (W3975) has the right to sail above his proper course, he can do that - but again must stop changing his course towards Geoff Edwards to windward of him when the latter is so close aboard that he is on the verge of being no longer able to keep clear. If the two boats are converging because Bob changed course at a time when Geoff did have room to respond, Bob is entitled to keep sailing that converging course and it is up to Geoff to get out of the way. 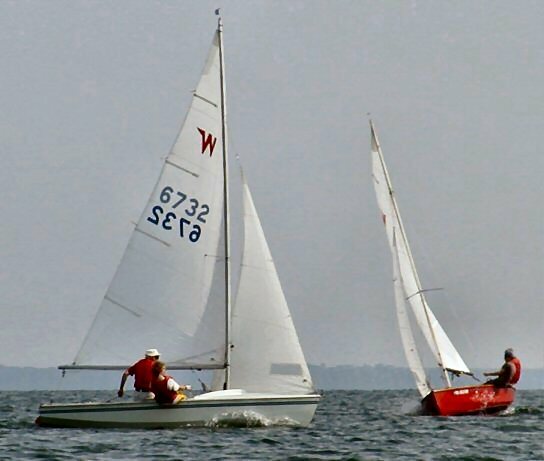 Rule 16.1 also applies here: Just before the start signal, Doug Netherton (7928) and Uncle Al (3854) seem to have come so close together that Al, being leeward boat and thus having right-of-way, must be careful not to infringe rule 16.1. 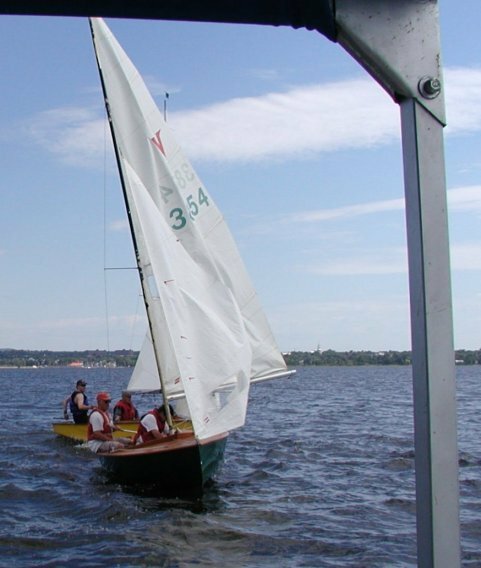 He appears to be pretty much in the position where he is no longer permitted to change course towards Doug, not even to assume his proper, close-hauled course and/or to cross the starting line. Of course, such a problem can be avoided by sitting on the line with your bow pointed in at least a close-hauled direction!! Once Brian Egan (yellow hull) has acquired right-of-way and "initially given Uncle Al (3854) room to keep clear", Brian is still bound by 16.1 which limits him to changing course only in such a way that Al will be left with room to keep clear. Since Al will just be starting to regain steerage way by the time Brian gets past Al's boom, Brian must take care not to alter course too violently to windward towards Al who will have limited ability to respond. If Al does a prompt, seamanlike job of trying to keep clear, but Brian still hits him because Brian has changed course, Brian has broken rule 16.1. 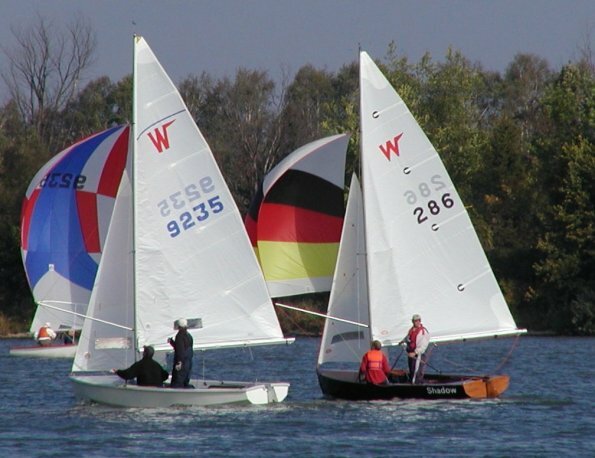 A common misconception is that the "new" rules permit "barging" at the windward end of a starting line. Above, Len Macdougall (W6732) is so close to the start mark that he has nowhere to go and will not be able to change course to keep clear. In this situation, it is true that Bob Kennedy (W3571) is not permitted - under 16.1 - to alter course towards Len in such a way that the latter is unable to keep clear, which would be the case here. Bob is however entitled to hold his course and/or speed up. 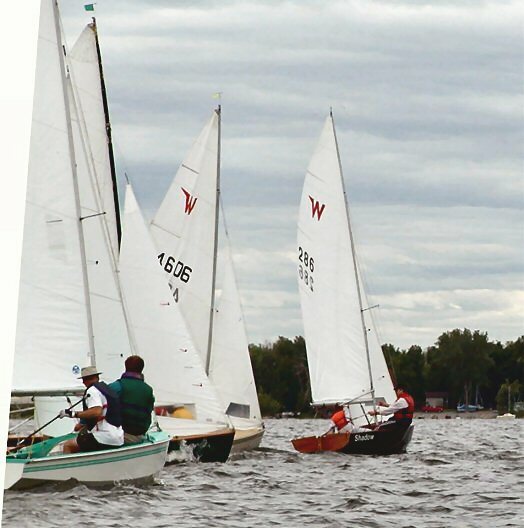 If Bob limits himself to that, and the two boats converge to a near collision which Bob then avoids by bearing away, then Len has fouled Bob under rule 11 (Same Tack, Overlapped). Rule 18 (Buoy Room) does not, of course, apply at a start mark surrounded by navigable water. One more time!! Uncle Al (red spi) is leeward and has right-of-way over Anders Friis (W222) who must keep clear of Al. As long as the latter holds his course, the keep clear responsibility is all Anders', but if Uncle Al luffs up, he must take care to do so in such a way as to give Anders room to keep clear!! Again - zoom lenses do, of course, lie! But if Peter (286) and Len (6732) are really this close together running on opposite tacks, Len (starboard) must avoid changing course towards Peter (port) at all costs. 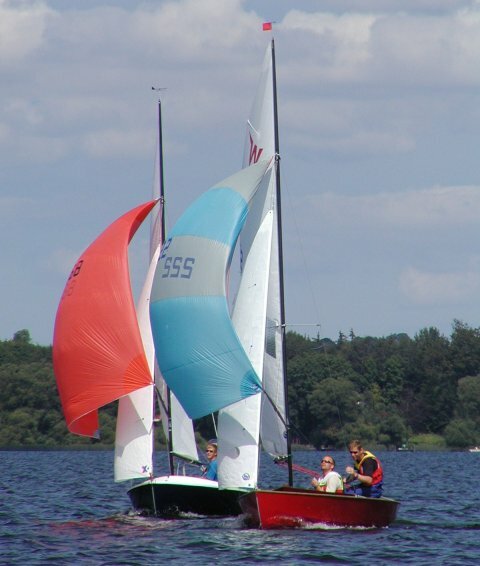 Len is however entitled to hold his converging course until Peter either alters course to keep clear or until Len decides he has to bear away or gybe to avoid an imminent collision. In the latter case, Peter will have fouled Len under rule 10. In this photo, Peter (black hull on port tack) is too far away for rule 16 to apply - but I had nothing better in my files. Imagine Peter, if you will, about one boatlength off Dwight Aplevich's bow (4606), and you will see a situation in which rule 16.1 applies. 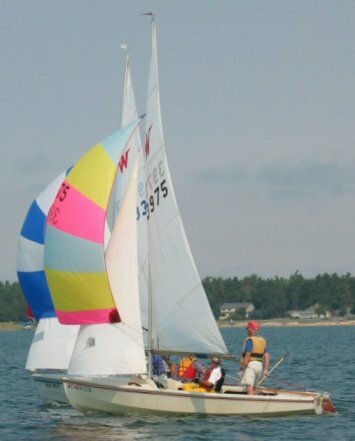 Dwight is in the process of turning from his close-hauled course onto a run and sailing his proper course. 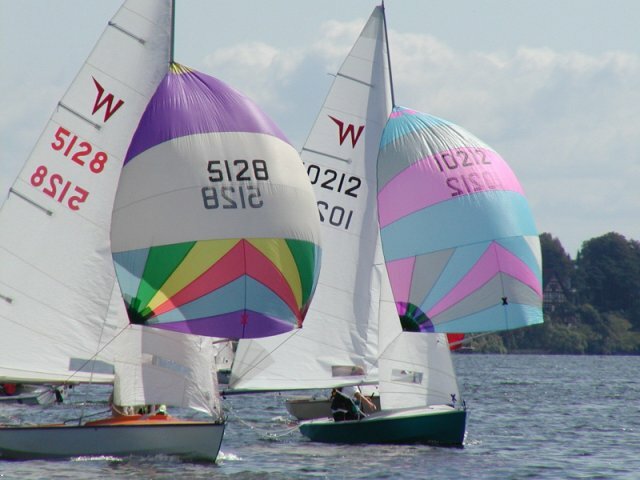 But rule 16 takes precedence over sailing proper course, and the turning right-of-way boat must take care not to alter course in such a way as to break rule 16.1 (or 16.2). This situation typically occurs - as it does here - at the end of a buoys to port beat which is followed by a run. 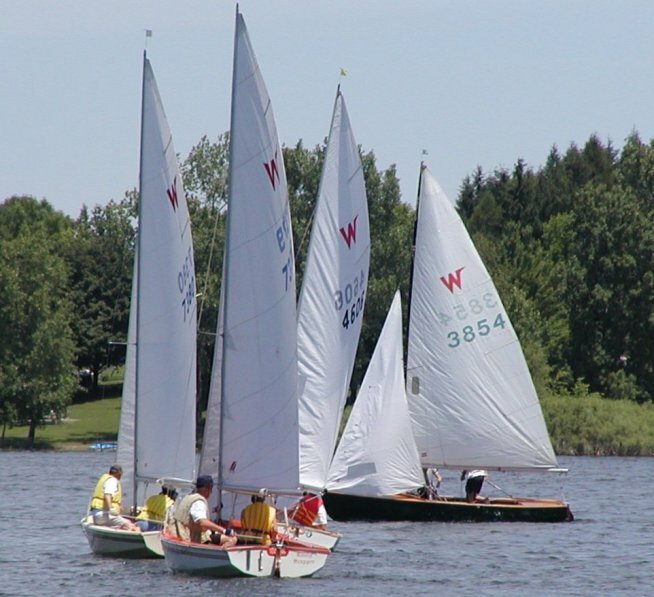 Here, the three starboard tackers running down Fanshawe Lake near London, Ontario, must take care not to change course in such a way as to deprive Bob Kennedy who is close-hauled on port tack, of room to keep clear. Y-Flyer 2546 especially must be careful not to bear away onto a collision course with Bob, since such a course change by 2546 would leave Bob with virtually no way of safely keeping clear - Bob certainly wouldn't want to have to tack a few seconds from now!! 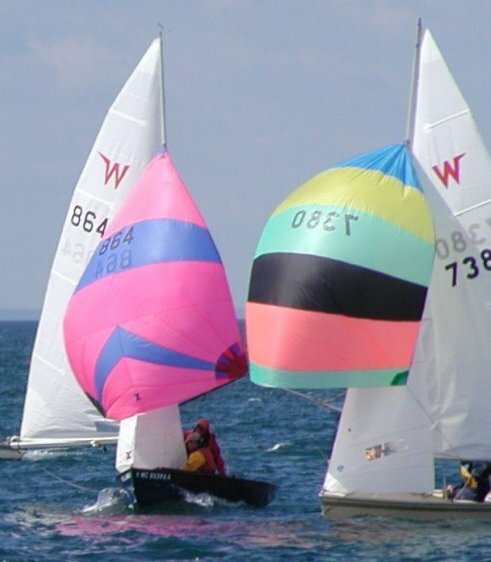 16.2 In addition, when after the starting a port-tack boat is keeping clear by sailing to pass astern of a starboard-tack boat, the starboard-tack boat shall not change course if as a result the port-tack boat would immediately need to change course to continue keeping clear. Our poor Chief Measurer, Len Macdougall (W6732)! I had to use a mirror image of the original photo to put him on starboard and cast him in the role of potential villain!! All this to illustrate that 16.2 prevents the starboard boat from "hunting" a port tacker by bearing away. Here Joe DeBrincat (red hull) is on port and keeping clear nicely. 16.2 prevents Len from bearing away in such a way as to make Joe immediately have to do more to keep clear. Even a windshift will be no excuse for bending or breaking rule 16.2. 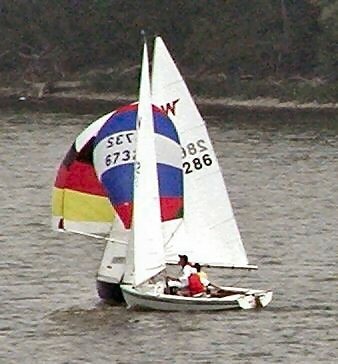 Rule 16.2 can, one supposes, apply between boats on a run but the two boats would have to be very close to each other. If Nick (864 above) chooses to luff up across Paul Laderoute's transom (7380), Nick will be cutting it very fine and Paul will not be allowed to make any course alteration "if as a result" Nick (the port-tack boat) will "immediately need to change course to continue keeping clear." Rule 17 never applies before the start where there is no such thing as proper course. However, pre-start manoeuverings do have a bearing on Rule 17 as follows:. Useful picture, this one! 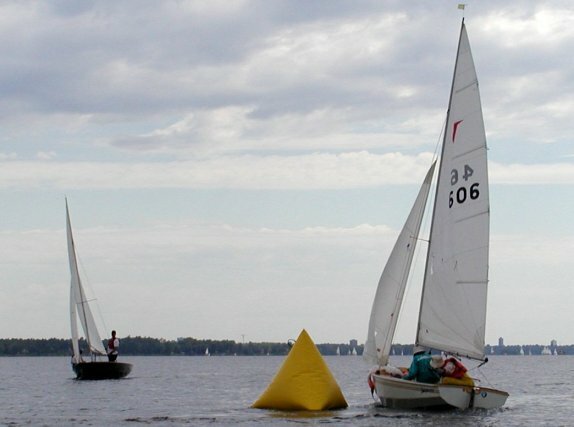 If a boat has become overlapped within two lengths to leeward from clear astern as yellow hull is about to do here, then she is bound by rule 17. Before the start that does not matter (no proper course!) but once the gun goes, she must sail no higher than proper course, i.e. close-hauled in this case. So - if in a few seconds, both Brian and Al (3854) end up sitting on the line beside each other and nearly head to wind, Brian must bear off to close-hauled as soon as the start signal is made. If Brian's overlap was not established from clear astern, he can sit head to wind forever if he is so (suicidally) inclined!! Here Peter Rahn (W286) has established an overlap from clear astern within two boatlengths of Brian Jeffs (W9235). While they remain overlapped and within two lengths of each other, Peter is not permitted to sail higher than his proper course. This limitation on Peter's rights as leeward boat does not however, confer any rights on the windward boat. Many windward boats in this situation mistakenly believe they are now entitled to sail their own proper course and leeward must keep clear. Nothing could be further from the truth ... well, perhaps a few government pronouncements ... but you get the idea. Note also that the the end of the first sentence of 17 does permit Peter to sail above his proper course if in doing so, he promptly sails astern of the other boat. The photo above illustrates this possibility very nicely. Rule 17 permits Peter to luff up sharply and cross Brian's transom in an attempt to get to windward of Brian. Still with the photo above, Peter is entitled to sail his proper course which might well be to sail higher than he is doing now in order to protect his wind from boats other than 9235 coming up from astern to pass to windward. Or Peter - like Uncle Al - may have a history of sailing "up in the lulls but down with the puffs" on the run, and that, too, would be permissible as his proper course, provided he is careful to change his course only in such a way as to give Brian room to keep clear (rule 16). Another familiar picture! But it does illustrate the point perfectly!! Here Uncle Al (W3854) has just crossed Heider Funck (W6) and tacked to cover. 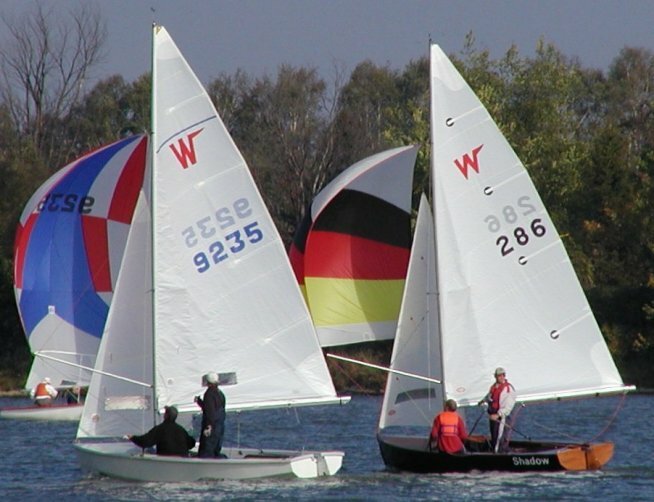 While Al was tacking, Heider became overlapped within two lengths from clear astern, which would cause 17 to "kick in", if it were not for the second sentence of 17 which indicates: "This rule does not apply if the overlap begins while the windward boat is required by rule 13 to keep clear." So here, Heider would be permitted to sail above his proper course, because the overlap began while Al was tacking.